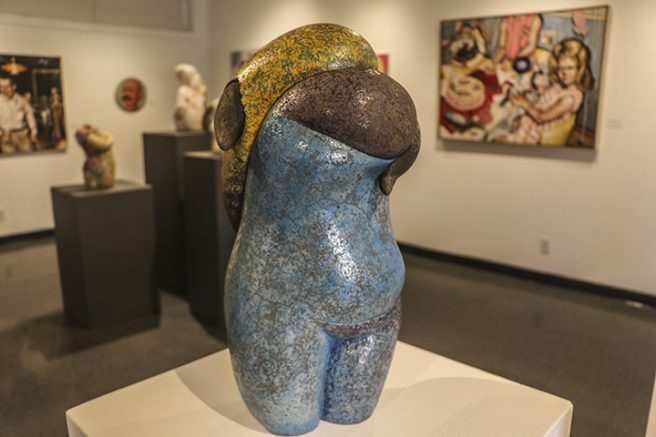 Mind bending surreal collages, peculiar yet playful acrylic portraits and similar yet unique stone—these are the types of sculptures on display in the Kaneko Gallery Jan 17-Feb 16. The artists whose works are on display are Julia Feld, Rachel Clark and Stephanie Ryan, the name of the exhibition is Figurative Introductions. Julia Feld uses the “form of the goddess”, said American River College English major Frankie Vanity. Vanity, a desk worker and artist herself, showed her satisfaction through her colorful language and description of the sculptures. Feld’s expertise lies within that of her glazed stone sculptures. The other two artists featured are Rachel Clark and Stephanie Ryan. Clark specializes in portrait style oil painting on panel while Ryan uses a mixture of acrylic, oil and collage on canvas. Feld’s sculptures, although rudimentary in form, illustrate her artistic view through the various different color schemes and glazes she applies to them. Clark creates a loose and playful atmosphere with the art she exhibits by the act of pasting googly eyes to the panel itself when she is finished crafting her portrait pieces. Ryan, on the other hand, hides her creative touches within her portraits so that the naked eye may not catch them on its first gaze of the piece. Upon further inspection of Ryan’s work, viewers may notice that there are peculiar birds, beasts and angels lying dormant on the edges or faded into the background of the pieces. While viewing “The Birthday Party”, a piece of Ryan’s depicting a young womans birthday in a bold and ominous fashion, a student who viewed the art remained intrigued. “The painting is different and it looks real, I like the expression on the girl’s face too,”said Cecil Ebiwok, a new student to ARC, “I love the color pallet.”. As Ebiwok continued to look at the piece of Ryan’s, his head tilted and eyes squinted. The artists of the Figurative Introductions exhibit have drawn extensive amounts of attention to their work by people and students of all sorts. The Kaneko Gallery is located near the Culinary Arts and Art departments at 4700 College Oak Drive. The closing reception is set to take place on Tuesday, Feb 14 from 5 – 7p.m. Be the first to comment on "Figurative Introductions at Kaneko Gallery"